I saw the movie Avatar when it first came out and sat down and wrote some of my thoughts about it. I wasn't happy with the incomplete version and thinking that a movie review didn't fit with my blog on books left it. However, I blog I recently read made a point that the best posts are those which aren't too polished and give more of your personality, so I decided to post this anyway. From James Cameron, the man who brought us The Terminator 1 and 2, Rambo 2, Aliens, The Abyss, True Lies and Titanic comes Avatar. A movie which is very mythic in scope and visually stunning to watch. I enjoyed all of the above movies with the exception of Titanic and I enjoy most sci-fi movies so I knew I would enjoy this one and I wasn't mistaken. I did go in a bit skeptical after all the hype which has surround this film but I was pleasantly surprised that this lived up to the hype. What was not to love about it? There are dragons and giants (both of the biological and mechanical kind), aerial and ground combat and huge explosions. Apparently Cameron came up with the story line all by himself without any other helps but you can see parts of 'Braveheart' and 'Henry V' in the stirring pre-battle speech. It also reminds me of plenty of 'Cowboys and Indian' movies I saw as a child. Throw in some Apocalypse Now and you have some idea of how this movie unfolds. A comment on continuity: I was interested is the fact that all the other creatures on the planet Pandora had the 4 eyes, six appendages/legs body structure and extra breathing holes on the body, so how did the Na'vi end up with the same body structure as humans, 2 eyes, 2 nostrils and 4 appendages? Most likely to make them more enduring to us as human viewers. As much as I enjoyed the movie, I did find it difficult to side with the Na'vi even if the humans where 'bad men', maybe this was because Cameron portrays all the human on the planet of Pandora as mercenaries or corporate greedies, there are a few rare moments when some of the humans on Pandora show some compassion for the natives. It seemed to perpetuate the 'Noble Savage' myth and tried to say that as humans we are the eco-terrorists only interest in material gains, we destroyed our world and now we are going to destroy theirs. It was too preachy in that sense. 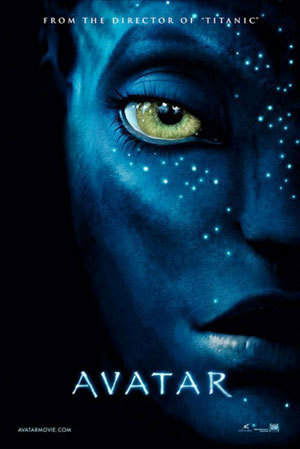 In a wikipediea article, I read that James Cameron mentioned that if [this] film [was] successful, he would be interested in seeing a trilogy being made [article here] so I am looking forward to see what he comes up with for the Avatar universe.